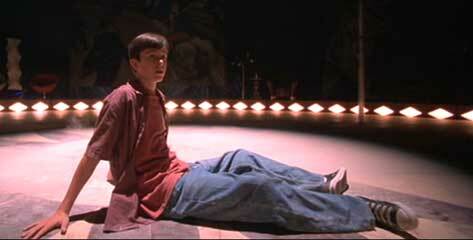 Ryan Kelley wears black high top Converse “Chuck Taylor” All Stars in the film. Ryan and his grandfather go out to explore the world of the Dust Factory. The Dust Factory is an unusual film about young teenagers, because it deals with issues of life and death instead of the usual commercialized pap about climbing high school social ladders or kids with super powers. As the film opens, we see Ryan Flynn (Ryan Kelley) at his grandmother’s funeral, reacting to seeing her open casket, and flinching at the burial site when he is asked to shovel dirt on the grave. Ryan’s family life has been tough over the past few years: his grandfather (Armin Mueller-Stahl) has acquired Alzheimer’s disease, become totally uncommunicative, and isn’t even aware that his wife has died. When Ryan was nine years old, he saw his father killed while saving him and his mother from an oncoming train when her car became stuck on the railroad tracks during a storm. His mother Angie (Kim Meyers) has been able to move on, and is remarried to Lionel (Peter Horton). But Ryan has withdrawn into a shell, mute of speech and communicating mostly with gestures and signals. On the surface his daily life is great, spending days playing roller hockey, fishing or racing with his best friend Rocky (Michael Angarano). Ryan still has a passion for astronomy and Gordie Howe, things he acquired from his father, and he is buoyed by the incredible optimism and support of Rocky, but he is drifting through life. Ryan finds a kindred spirit in Melanie, a beautiful young girl also trapped in the world of the Dust Factory. Things in Ryan’s life change suddenly one weekend day when he and Rocky are going out to fish and take a shortcut on an abandoned railroad bridge over the lake. Part of the bridge breaks away, and Ryan falls into the river. When he finally emerges from the deep water, he discovers that the world has changed. His friend Rocky is gone, and while the world around him looks the same, it seems to be thirty years behind the times. He sees a classic fifties sedan in his driveway and he meets up with his grandfather, who has completely recovered his faculties. The rooms in his house are partly what he remembered and partly what they were when his grandfather was active — before the house was remodeled. His mother Angie and Lionel are nowhere to be seen; the only other family member present is his grandfather. Ryan and Grandfather are now able to spend quality time together talking about life and enjoying the magnificent scenery. Ryan also meets Melanie (Hayden Panettiere), a vivacious young girl the same age as Ryan. The two hit it off, find that they share many of the same interests, and soon Ryan has completely opened up and learned to express himself again. Melanie explains to Ryan that they are now living in a world called The Dust Factory, “A home away from home until you’re ready to go back.” While much of The Dust Factory is a stylized version of Ryan’s real world environment, where people can appear and disappear at will in the fog, the main action takes place in a big top tent at the top of a large meadow supervised by an authoritarian Ringmaster (George De La Pena). In the big tent each person must eventually participate in a trapeze act to decide their fate, climbing up to the high trapeze, and then swinging over to and holding onto the hands of another trapeze performer. If successful in this leap of faith, a person will move on to the afterlife; if they are unable to hang on, they “get dusted”, falling into a pile of dust on the floor and returning to their previous lives. Melanie tells Ryan, “When you decide to make the leap you get one chance. You either make it and go on, or you get dusted and go home.” Melanie and Ryan quickly become close friends and share some interesting adventures in the idyllic world of The Dust Factory together and with Ryan’s grandfather. But eventually Ryan must make another important life altering decision: will he continue to stay in The Dust Factory world with Melanie and Grandfather where nothing changes and nothing is authentic or return to the real world where he came from. The balance of the story revolves around this decision and what happens as a consequence. Ryan and Melanie dance together as Ryan’s grandfather watches. Much has been said about the surreal world of The Dust Factory, but this is the hardest part of the film for audiences to understand, and probably the main reason that the film hasn’t received greater acceptance. The analogy of the circus competition seems to send a muddled message: is success going on to the afterlife and failure getting dusted and returning to your previous life? Likewise there are unexplained times when a frustrated Melanie or Ryan kick at the dust pile and are almost taken down by myterious black tendrils that momentary grab and pull them down into the ground. It would seem more logical and appopriate that young people like Ryan and Melanie would be encouraged to return to their previous realities and try to make something of their unfulfilled lives. If you look at other components of The Dust Factory, the whole idea of the dream world seems to be a kind of extended nightmare, permutations on a series of events based on Ryan’s real life experiences. Ryan’s fear of the railroad tracks which suddenly appear and vibrate in the meadow are a reminder of his father’s tragic death, his showdown with the Ringmaster is turned into a shootout in roller hockey because that sport is such an important part of his life, and his extended conversations with his grandfather are a desire to regain the rapport that they most likely had before Grandfather acquired Alzheimer’s disease. In addition, Ryan must search for paradise, and make a decision about whether to stay in the limbo world of The Dust Factory, go on to the afterworld, or return to the reality of his former existence. Ironically, Ryan keeps saying that he can’t find paradise or that he doesn’t know what paradise is while he becomes close friends with a very attractive and personable young girl, plays in a pristine part of the world with beautifully landscaped houses, green meadows, clear blue lakes, snow-capped mountains, and perfect weather, and receives counseling about how to live his life from his wise and supportive grandfather. (Where do you sign up for this world?) The world of The Dust Factory is so much more complex than Ryan’s regular world, it becomes a perplexing factor to the audience because it is not explained if this is the result of a comatose state or that it all happened in a brief instant while Ryan was in the lake water after his accident. Although The Dust Factory concerns itself with issues of life and the afterlife, it stays away from spirituality or religion, instead using its circus analogy to explain things. The timeline of Ryan’s regular existence is confusing also. His friend Rocky explains to some other kids at the beginning of the movie that Ryan is mute because he has been traumatized by the death of his father. Understandable, but this happened when Ryan was nine years old, and now, four or five years later, his mom has remarried and seems very well adjusted. Ryan also seems pretty well-adjusted for a kid who cannot properly grieve or move on from this tragedy. You wonder how Ryan could survive at school, or maintain his friendship with Rocky over so many years without at least some conversation. 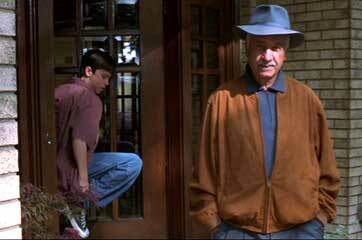 And why wouldn’t caring parents like Angie and Lionel at least get some some counseling for Ryan? It’s too bad that the story line is so undisciplined because nearly everything else about the film is a delight. It’s beautifully filmed in the Pacific northwest, superbly cast, and the actors give you great performances. 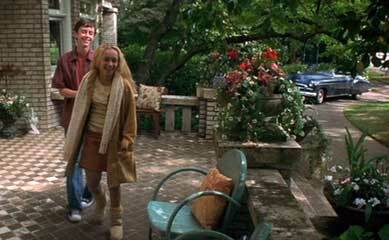 Ryan Kelley, Hayden Panattiere, and Armin Mueller-Stahl are a delight to watch in this film. They deliver their lines with such personality and natural aplomb that you are immediately drawn into their world. And it’s a very pleasant world, far away from the interruptions of modern life, and full of ideas, emotions, imagination, and natural beauty. The strengths of their performances make this film work despite the flaws in the storyline. Eric Small produced, directed, and wrote this film. It’s too bad that he couldn’t step away from the project a little bit, and get someone else’s perspective before it was completed. The Dust Factory has the ingredients to be a classic film, but fails in establishing a viable link between its elements of fantasy and reality. Ryan finds himself in the main ring of the Dust Factory. Ryan watches the Ringmaster trample through the dust. 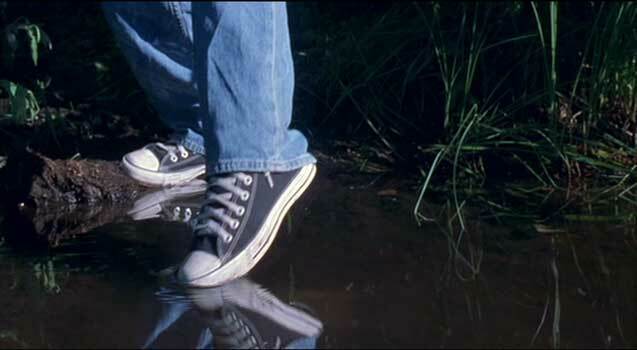 Ryan Kelley wears black high top chucks throughout the film, except when skating in his roller blades or dressed up for formal occasions like the funeral and the formal dance in the ballroom. The cinemaphotography is clear, bright and chucks-friendly and there are several notable closeups. The first occurs just after Ryan meets Melanie and she show him how she can skate on water and encourages him to do the same. (Apparently the season that you enter the Dust Factory stays with you. Since Melanie entered in winter, she can skate on a lake and always wears heavy boots and a warm coat.) 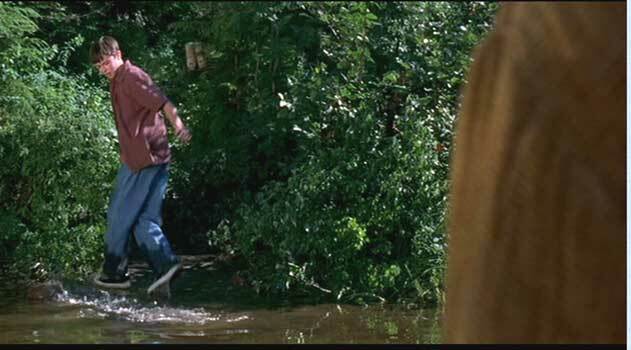 When Ryan tries to follow and his foot falls into the water, she explains, “Oh, you must have come here during the summer.” There are also a couple of scenes where we see Ryan and Melanie walking through the meadow toward the circus tent, but suddenly happen on a set of railroad tracks that vibrate ominously, a reminder of how Ryan’s father was killed. You can view shots of these scenes by clicking on the thumbnails below. Left to right: 1) Melanie tells Ryan he can walk on water like she does. 2) He puts his foot out to try it. 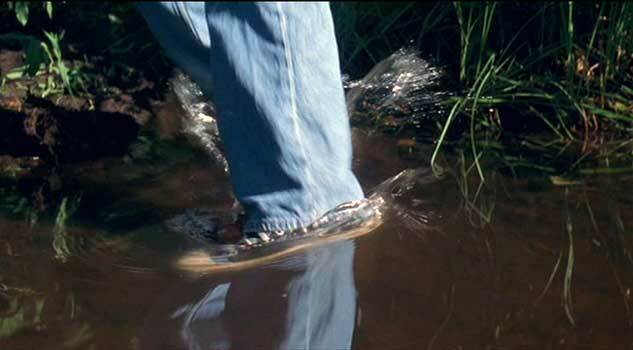 3) Ryan’s foot goes right into the water. 4) Ryan jumps away. 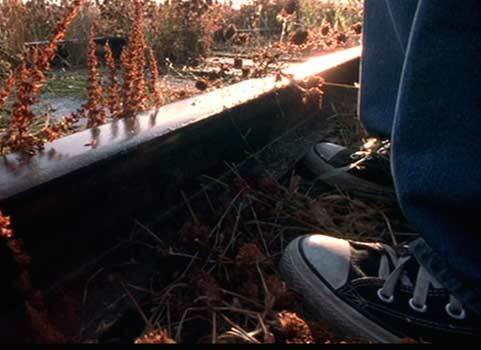 5) and 6) Ryan hesitates at the fateful railroad tracks (two shots). 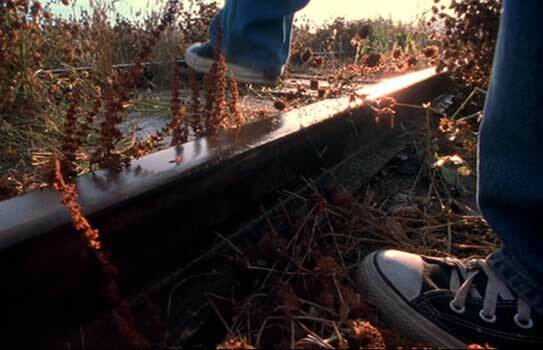 7) Ryan get the resolve to walk across the tracks. 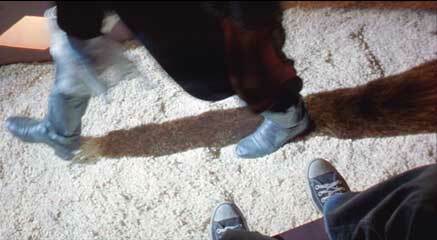 8) Melanie came to the Dust Factory in the winter and wears heavy boots; Ryan came in the summer and wears black chucks. The Dust Factory. (2004) Ryan Kelley, Hayden Panettiere, Armin Mueller-Stahl, Kim Myers, George De La Pena, Michael Angarano, Peter Horton. Written and directed by Eric Small. Categories: Drama, Coming of Age, Fantasy/Science Fiction. Support the film industry by purchasing genuine DVD, Blue Ray, or streaming copies of these films. Illegal copies only help profiteers. Make sure your money goes to the producers and artists who actually create these films. Still images from the film are used here as teasers to get you to view an authorized copy. 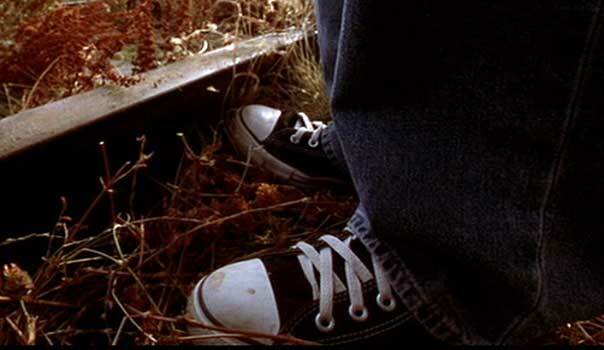 If you have information about a film where a main character wears chucks, contact us at films@chucksconnection.com..